With the prevalence of bullying and suicide in veterinary medicine, self awareness and emotional intelligence is a key asset to the veterinary professional. Join us for a 1-hour VETgirl online veterinary continuing education webinar on emotional intelligence and its role in the veterinary professional. Dr. Bob Murtaugh, DACVIM, DACVECC, a leader in veterinary medicine, will review how self awareness and emotional intelligence can build veterinary relations and team work in the veterinary clinic. Excellent presentation! 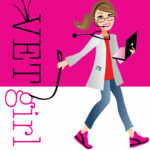 VETgirl offers the BEST webinars, IMO! But you want to purchase this webinar for CE credit?